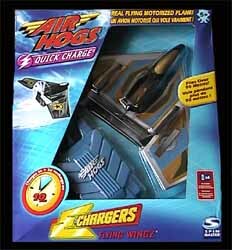 The Air Hogs Quick Charge Flying Machines, are a range of cheaper aircraft designed for both the novice and hardened flying enthusiast. We received the Flying Wingz stealth jet to review and have to say that at £10 it is incredibly good value for money. These models are really simple to use. All you have to do is charge them for ten seconds and then send them soaring into the sky. They also come in several different styles and can travel up to 100 yards - so playing in your back garden is pretty much out of the question. It also comes with some handy information on how to get the best flight out of your plane. While this range is really aimed at children, I know that it is going to appeal to the adult too. Come on! Admit it! Parents might claim to buy these models for their kids, but we all know that they are buying them for themselves. 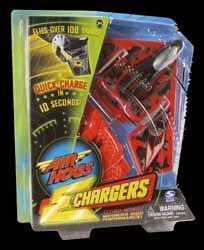 The good thing about the Quick Charge range is that kids can play with these, while their parents play with the larger aircraft. Or, parents can get just as much fun out of them too. Other stockist of this item include: Asda, Toys 'R' Us and all good toyshops.